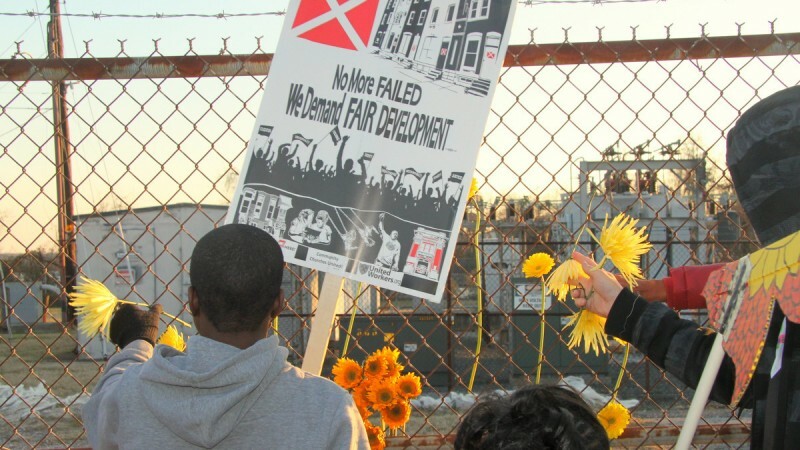 The Maryland Department of the Environment today declared the permit for the Fairfield incinerator invalid, apparently ending a years-long battle that pitted residents and environmental and student groups against a New York-based company that sought to build the trash-to-energy plant in South Baltimore. MDE Secretary Benjamin Grumbles released a statement today saying that Energy Answers International’s 2010 permit from the Maryland Public Service Commission had expired because no work had taken place there for more than 18 months, a requirement of the permit. “Consequently, by operation of law the air quality provisions of the Energy Answers CPCN [Certificate of Public Need and Necessity] have expired and are no longer valid,” Grumbles wrote in a letter to Energy Answers President Patrick F. Mahoney. Leaders of the fight against the project applauded Grumbles’ decision today. “This is a great decision for clean air and for environmental justice,” said Leah Kelly, Attorney with the Environmental Integrity Project, which filed the legal action precipitating today’s decision. Representatives of Energy Answers have not yet responded to a request for comment. But members of the activist groups that have hammered away at the issue were crowing today. Residents of the Curtis Bay, Brooklyn, and Brooklyn Park neighborhoods closest to the incinerator site – including a student-led organization called Free Your Voice – have been fighting the proposed 4,000-ton-per-day trash burning incinerator because of the air pollution they say it would add to a neighborhood already suffering from toxic air emissions. “Today marks a crucial point in the communities of Brooklyn, Curtis Bay and Brooklyn Park,” said Destiny Watford, who grew up in the area and has been leading the campaign against the incinerator. Watford said residents have been not only opposing the project but looking for alternative uses for the land that would generate jobs for the community. One of seven people arrested at a protest at MDE headquarters in December also applauded the agency’s decision. “It’s awesome that MDE, after all of the pressure we’ve been building, is finally taking a step in the right direction,” said Charles Graham, a senior at Benjamin Franklin High School. As recently as last week, a representative of Energy Answers was in Curtis Bay at a community association meeting answering residents’ (largely hostile) questions about the project. “Why did you chose Curtis Bay?” a woman can be heard asking on a video of the meeting, distributed by Free Your Voice as part of their campaign to sway MDE. “Because they thought they could roll over on us,” someone mutters as Energy Answers President Patrick Mahoney begins his answer. “Why Curtis Bay?” from Free Your Voice on Vimeo. The incinerator is fundamentally wrong from Free Your Voice on Vimeo.